* Chomp and Stomp Grimlock: toy demo video uploaded to YouTube, Hasbro's publicity and our original photos from the event. * Flip and Change Assortment: Lockdown, Optimus Prime, Grimlock, and Bumblebee. The Hasbro representatives we talked to said these toys were aimed at kids ages 4-8. * Platinum Sub-series: Year of the Horse Optimus Prime and Starscream, character pages and photos. So this is what the whole uproar was about when I got to thinking/fearing that all Transformers were going to be made for kids. Okay, so I must confess, I freaked out a little with worry that all Transformers were going to be made for 4year olds. To see some of these on the shelves, I'm totally cool with that. (Knowing that there are the "Movie Generations" that are going to be more detailed/complex and what I look for... Actually, I'd say that some of them look cool enough that I'll probably pick up a few myself. The giant Grimlock nice. Not sure if it's $80-cool, but we'll see. 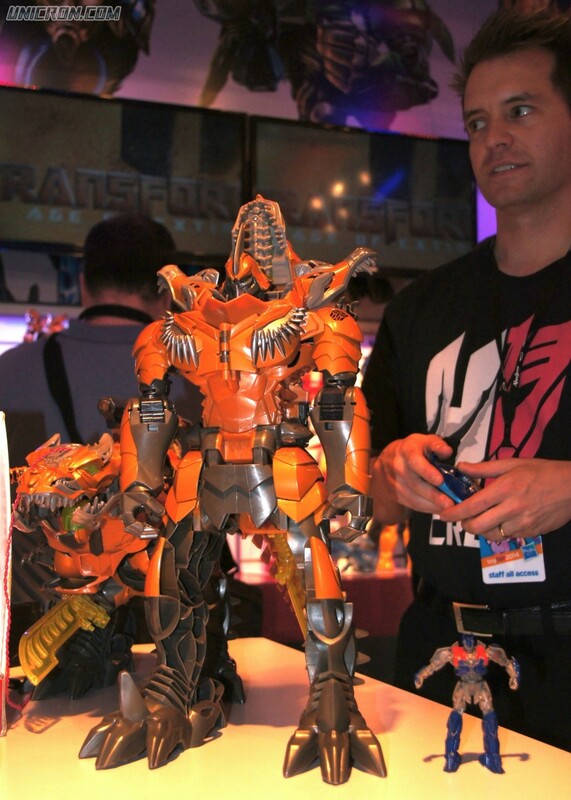 ~"The cool thing is that this toy is designed to be *to scale* with Grimlock/OP as they appear in the film." This being said as the two toys were in robot mode. where Optimus in 'bot mode doesn't even make it up to Grimlock's knee! If that's actually the case, then the Dinobot leader isn't t-rex sized, he's Godzilla sized. As in a small skyscraper height! Crazy.